How many and what kind on which platform? #too #many #hashtags #are #not #a #good #idea #but #what’s #too #many #where #? Hashtags snuck onto Twitter in 2007 and are now ubiquitous with most social media platforms - especially Instagram. Recently, Instagram even allowed emojis to be used as hashtags. Hashtags are no longer just millennial speak, now brands and even politicians are acceptable users of the picture characters. Since it’s fair game for all, what are the best practices for hashtags on social media? For Twitter the rules seem fairly straightforward. Use one or two very specific hashtags that get you into the right conversation. #YYCFoodies or #CalgaryEats are popular hashtags about food in Calgary, making them quite useful in social posts about recipe blogs, restaurant reviews or food events around town. More than 2 hashtags, however, create a 17% drop in engagement, so choose wisely! Really basic and overused hashtags like #food and #yum are unlikely to garner you any attention due to a flood of use and a lack of geographical indication. Facebook, on the other hand, favour posts without the use of any hashtags. While they’ve been usable since 2013, experts have different opinions on whether they are beneficial to your posts or not. Studies show the more you use them, the less likely you are to have any engagement, but they could still be useful if you’re hoping to piggyback on the value of another event or trend. For example, if you are a cafe taking part in the Hot Chocolate Festival in Calgary it could be very useful to use #YYCsBestHotChocolate to be a part of that ongoing conversation on Facebook. Instagram is where it all changes. 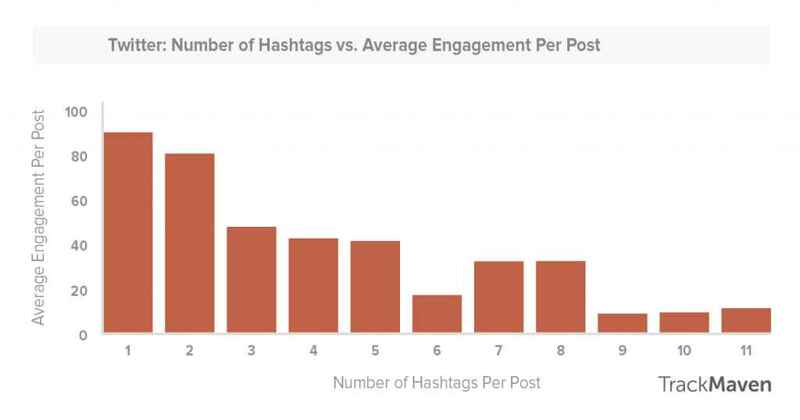 Instead of a sharp decline of engagement after two hashtags, the engagement actually begins to build after the 6th. The height of engagement peaks at 9, and sticks around at that height until it starts to peter out after 11. That being said, there is no limit to the amount of copy in an Instagram post, and engagement stays at a reasonable level even after 15 hashtags, so one can tag freely without concern of putting people off entirely resulting in unfollows. One handy trick is a vertical ellipses. By filling a line with a simple period, you can push all the hashtags to the bottom of the post. Hashtags you’d like people to see can stay in the top body of the post, the lower hashtags are still searchable but the clutter of the post is reduced. Above all else, when it comes to hashtags on any platform, one must always do their research. Using a hashtag with relevance to your demographic, location or brand is essential to get the most out of your tags. Find out hashtags people are using - get in on the right conversation for your demographic. Ignore overused hashtags (fun, cats, blessed) - your post will almost instantly get swept away in the overwhelming amount of uses. Research your competitors - find out what they’re using, and what they’re missing. Check hashtag feeds - find tags that are trending in that conversation or location. Be different - figure out how to stand out from the rest on that hashtag. Have some fun - hashtags are the place for a little sass or humour, so go for it!